Home > Akzo Nobel Coatings Inc.
TRINAR is our premiere liquid spray coating that meets the AAMA 2605 spec, and is ideal for the monumental project as well as any residential or low rise project that requires lasting durability and beauty. TRINAR is a very versatile system, and is available in both solid and mica colors, and as a three coat product for bright saturated colors and metallics. We also have a wide selection of products and finish options to meet other AAMA specs, such as CERAM-A-STAR E for AAMA 2604, and ACRA-BOND ULTRA for AAMA 2603. Our quality systems guarantee unparalleled batch to batch consistency, in addition to reliable, hassle free application. To ensure the highest level of performance, all of our finishes have been thoroughly tested in a comprehensive South Florida exposure program. 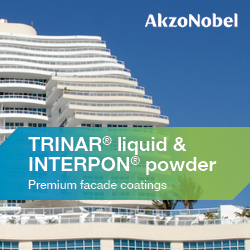 AkzoNobel is the largest global coatings company, with operations in more than 80 countries. Headquartered in Amsterdam, the Netherlands, we are a Global Fortune 500 company and are consistently ranked as one of the leaders in the area of sustainability.